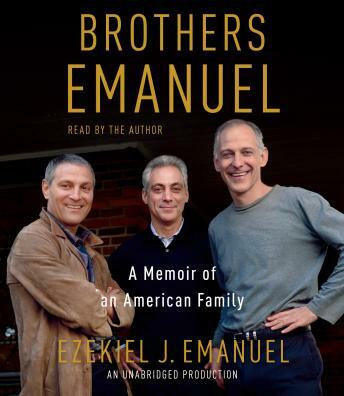 For years, people have been asking Ezekiel “Zeke” Emanuel, the brash, outspoken, and fiercely loyal eldest brother in the Emanuel clan, the same question: What did your mom put in the cereal? Middle brother Rahm is the mayor of Chicago, erstwhile White House chief of staff, and one of the most colorful figures in American politics. Youngest brother Ari is a Hollywood superagent, the real-life model for the character of Ari Gold on the hit series Entourage. And Zeke himself, whom the other brothers consider to be the smartest of them all, is one of the world’s leading bioethicists and oncologists, and a former special advisor for health policy in the Obama administration. How did one family of modest means produce three such high-achieving kids? Here, for the first time, Zeke provides the answer. Set amid the tumult of Chicago in the 1960s and 1970s, Brothers Emanuel recounts the intertwined histories of these three rambunctious, hypercompetitive Jewish American boys, each with his own unique and compelling life story. But ultimately, this is the story of the entire Emanuel family: the tough, colorful Old World grandparents; a mischievous, loving father who immigrated to the United States with twenty-five dollars and who enthralled his boys with tales of his adventures in Israel’s war for independence; and a proud, politically engaged mother who took the boys with her to rallies and protests—including a civil rights march through the streets of Chicago led by Martin Luther King himself. Even as the Emanuels distinguished themselves as individuals, the bond of brotherhood that tied them together was never broken. Brothers Emanuel is a wry, rollicking, and often poignant narrative of how one American family succeeded in raising three extraordinary children.